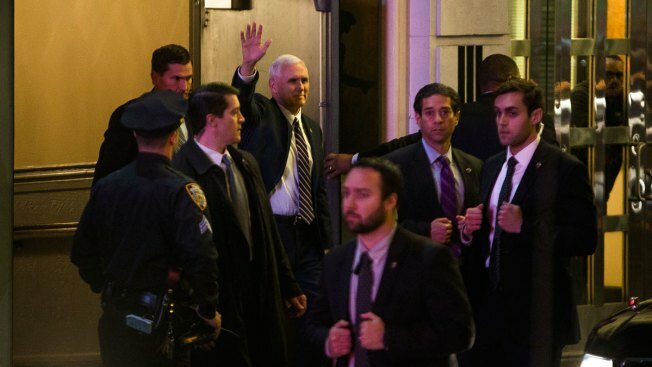 Vice President-elect Mike Pence, top center, leaves the Richard Rodgers Theatre after a performance of "Hamilton," in New York, Nov. 18, 2016. The cast of Broadway’s “Hamilton” spoke directly to Vice President-elect Mike Pence as he sat in the audience after a show Friday night, saying they hope the production inspired him to govern in a way that protects a diverse America -- a statement President-elect Donald Trump took issue with on Twitter Saturday morning. "Vice President-elect Pence, we welcome you and truly thank you for joining us here tonight at Hamilton, we really do," said actor Brandon Victor Dixon, who plays Aaron Burr, with the cast assembled behind him. "We, sir, we are the diverse America who are alarmed and anxious that your new administration will not protect us, our planet, our children, our parents, or defend us and uphold our unalienable rights, sir," said Dixon. "But we truly hope this show has inspired you to uphold our American values and to work on behalf of all of us," he continued. "We truly thank you for sharing this show, this wonderful American story told by a diverse group of men, women of different colors, creeds and orientation." The audience clapped and cheered as Dixon spoke. 'Hamilton' creator Lin-Manuel Miranda responded online later in the evening that he was proud of Dixon and the cast. "Proud of @HamiltonMusical. Proud of @BrandonVDixon, for leading with love. And proud to remind you that ALL are welcome at the theater," he tweeted. Trump responded to the cast on Twitter Saturday morning, claiming they “harassed” Pence. In another tweet, Trump demanded the cast apologize for the statement. Dixon responded to the President-elect on Twitter, writing he appreciated Mike Pence listening to the cast's message and told Trump that "conversation is not harassment." Pence also drew boos from the audience before the show as he was taking his seat in the theater. Video posted to social media shows the audience at the Broadway show reacting boisterously as Pence walked into the theater with Secret Service in tow. "Here's Pence getting booed as he gets to his seats at Hamilton," tweeted an audience member who captured the loud reaction on video. Ron Rawlings, who was visiting from Dallas, Texas, later told NBC 4 New York, "Everything was calm, and then we heard almost a hysterical booing, went on for a long time. As my daughter and I stood up to see what was going on, we saw Vice President-elect Pence coming in." "It was the most gross display of disrespect I've ever seen. It was awful," Rawlings continued. Rawlings said of Pence's reaction: "He was very dignified, and there were a couple of people that showed support, he acknowledged them. He took his seat, he was very kind, he was very gracious." Hannah Blau, visiting from Columbus, Ohio, said, "Some people were clapping, but the boos were overwhelming." She added that she thought it was "cool" that "people are still vocalizing their opposition." "I thought LeBron Game 6 in Boston was the emotionally charged performance until this Hamilton performance with Mike Pence in audience," tweeted Noah Coslov, a digital sports editor.